If you have not tried biking on the sand yet, you will only realize how different it is from riding on the road once you have tried it. You can expect that the ride is going to get bumpy. You may also need to store more often as compared to when you are riding on the road. A lot of people find it tricky in the beginning but once they get the hang of it, they already know that this looks great. 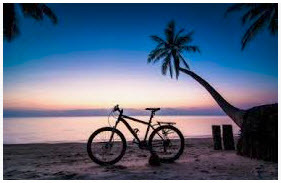 First of all, you need to have the right beach bicycle in order to start riding on the beach. It can be tricky if you are using a bike that is intended to be used in a different manner. The right bicycle will make going through the sand easier and less bumpy. It can be problematic for some people to find the right bicycle that they can use on the beach. They can check different brick and mortar stores and not find the ones that they want. If this is the case, you can look for a bike customizer. You can choose the various parts that your bike will have to make it the best one for your needs.  Stick with sand that is somewhat wet or sand that is above hard soil. This can make riding so much easier as compared to going through really thick and deep sand.  You can bike near the water but make sure that you will not ride your bike on water. Your wheel might get stuck underneath the wet sand.  It is best if you would use thick wheels. Check out the best bikes for men. Find one that you like and customize the wheels if you are not happy with how the wheels look like. If you do not have thick wheels, your wheels can be partially deflated to go through sand easily. When you are using a bicycle that comes with gears, choose low gear when going through some tricky sandy areas. It will make cycling so much easier.